From Mayflower Marina, follow the channel past two high bridges. Then it’s not far up to Cargreen Quay, where you can usually find a mooring. This is the real rural West Country, with patchwork fields sloping to the river and the tides slowly changing the scene. High water brims up to the farm hedges and mud flats creep out during the ebb, exposing tasty morsels for herons and egrets. West of Plymouth you enter Cornish waters, where the coast looks lush and tempting behind Whitsand Bay. You see Looe Island off the entrance to Looe’s long tidal harbour (pictured above) and then the cliffs feel slightly more rugged and remote. Polperro comes next, a picture-postcard fishing village hidden until you reach its gap in the cliffs. 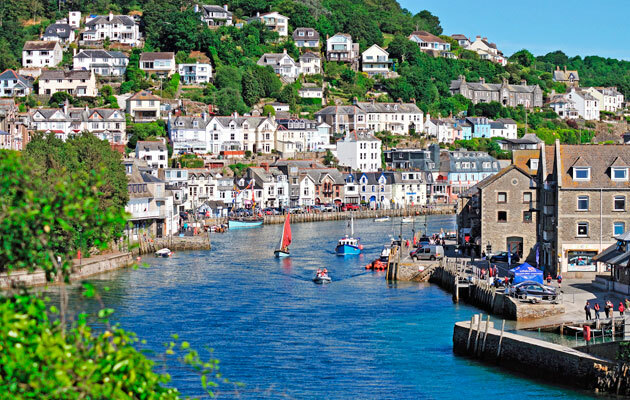 Then you see a bright jigsaw of cottages above the tiny harbour. There are visitor buoys here or you can anchor off for a lunchtime stop. Cawsand Bay is a classic anchorage on the west side of Plymouth Sound, where Cawsand and Kingsand villages merge along the shore. Dandy Hole is an amazing low tide pool three miles up St German’s River. An hour before HW, head west off the Tamar just below the bridges.